To open up those shadows to be more like what our eyes saw when we took the photo, go to the Basic panel and click-and-drag the Shadows slider to the right.This backlit problem happens a lot because our eyes are so amazing that they can correct for a huge range of tones, tremendously more than even the most expensive camera sensor. So, while we’re standing there in front of our subject, they don’t look like a silhouette—we see them properly exposed. When we look through our DSLR camera’s viewﬁnder, they still look properly exposed. But, when we press the shutter, and it passes the image to our sensor—which captures a much narrower tonal range—the result is your subject winds up looking like a silhouette. Luckily, that Shadows slider works wonders—just drag it to the right and watch the magic happen. If you have to drag really far to the right to bring your subject out of the shadows, you run the risk of having the image look a bit washed out. So, if you see that happen, just increase the contrast (drag the Contrast slider to the right) until it doesn’t look washed out. Start by clicking on the Crop tool (C) up in the toolbar at the top of the window, then just click-and-drag it out over the area of your image you want to keep.The areas that will be cropped away now appear back-screened.To change your crop, just click-and-drag on any of the little handles that appear on the corners and sides of the cropping border. To move the entire cropping border, just click inside it and drag it where you want it. To resize it proportionally, press-and-hold the Shift key, then click-and-drag a corner handle in/out. To ﬂip your crop from wide to tall (or vice versa), just press the X key on your keyboard. To rotate it, move your cursor outside the cropping border and its icon changes into a double-headed arrow. Click-and-drag to rotate the entire crop border. When the crop is set like you want it, press the Return (PC: Enter) key to lock it in. Lastly, to delete your cropping border altogether, just hit the Delete (PC: Backspace) key. 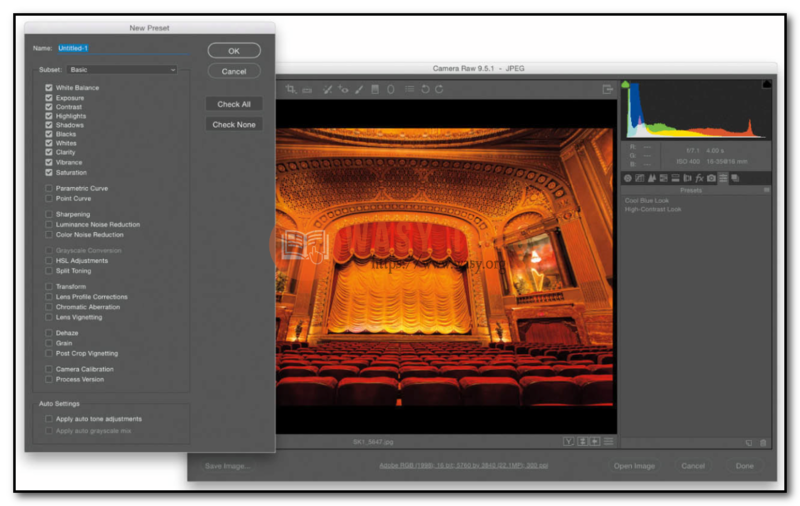 Click-and-hold on the Crop tool (up top in the toolbar), and a pop-up menu with a bunch of cropping options will appear. The ﬁrst option in the menu, Normal, is just regular ol’ free-form cropping. 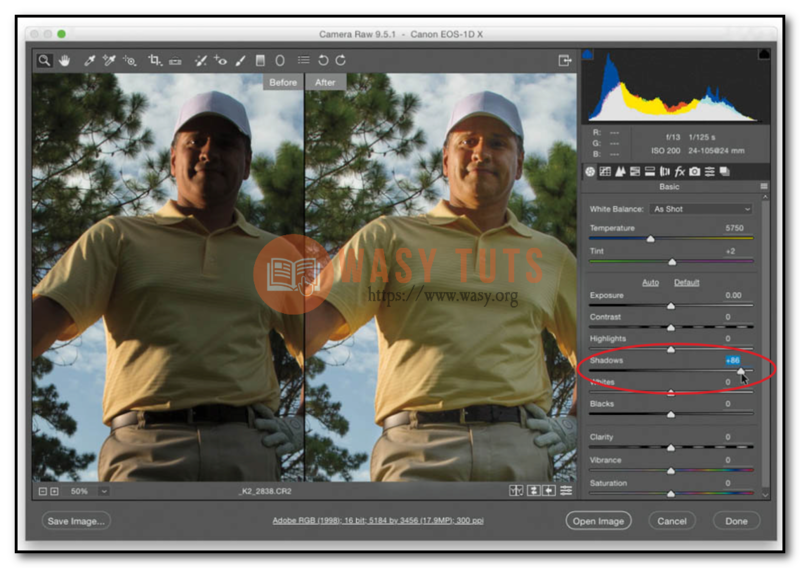 To choose a particular crop ratio, choose it from that pop-up menu (like 4 to 5, for example), and now when you click-and-drag with the Crop tool, it’s constrained to a 4 to 5 ratio size. Once your cropping area is in place, you can change to any other cropping ratio by just choosing it from that same menu, and it’ll instantly change to that ratio. To remove your crop altogether, just hit the Delete (PC: Backspace) key. 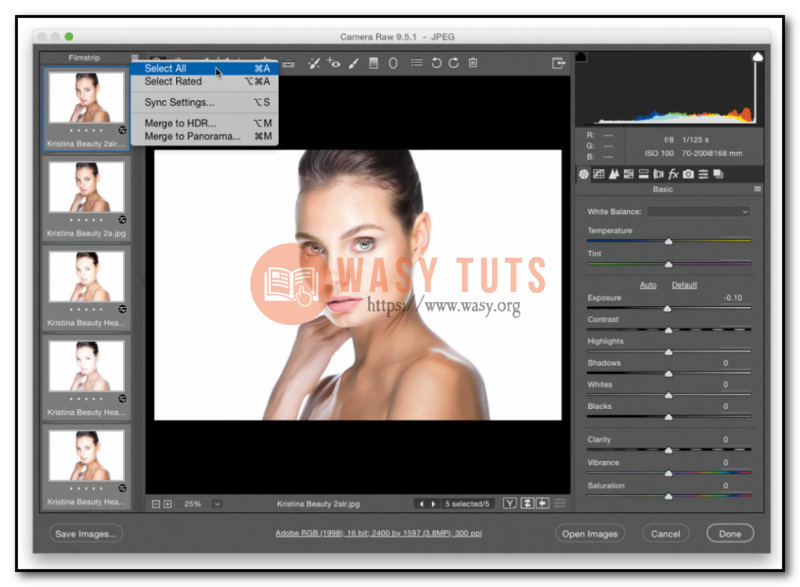 There are three ways: (1) Start by clicking on the Straighten tool (A) up in the toolbar at the top of the window; it’s the seventh tool from the left), then just drag it along an (edge you want to be straight (for example, in a landscape photo, you’d drag it along the horizon line), and it straightens your photo.The second method (2) is to let Camera Raw auto-straighten it for you. Click on the Lens Corrections icon (it’s the sixth icon from the left) beneath the histogram, then click on the Manual tab, and under Upright, click on the Level icon (it’s the one in the center). Lastly, (3) you could just do it yourself by rotating the photo until it’s straight: click on the Crop tool (C) in the toolbar, move your cursor outside the cropping border, and then click-and-drag in the direction you want to rotate. 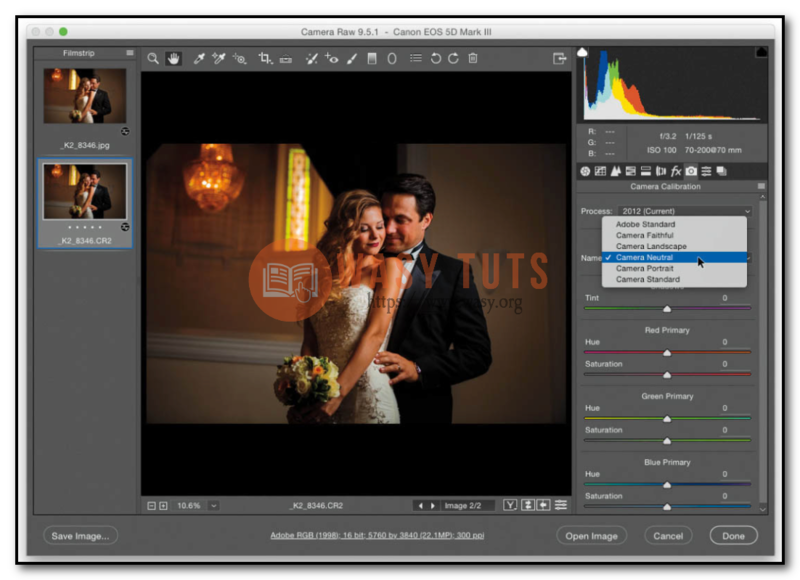 Stop dragging when the image looks straight, then press Return (PC: Enter) to lock in your crop. To get rid of edge vignetting (a problem caused by your lens), click on the Lens Corrections icon (it’s the sixth icon from the left) beneath the histogram, then click on the Proﬁle tab, and turn on the Enable Lens Proﬁle Corrections checkbox (your lens brand and model should appear in the pop-up menus below. If it doesn’t, see the tip below). That will often ﬁx the problem right there, but if it doesn’t quite do the trick, there’s a Vignette slider at the bottom of the panel that lets you ﬁne-tune the amount, so try that and see if it helps. If that still doesn’t do the trick, then you’ll have to do it manually: Click on the Manual tab and near the bottom you’ll see two Lens Vignetting sliders. Drag the Amount slider to the right to brighten the corners of your image, removing the vignetting problem.The next slider, Midpoint, controls how far your edge brightening extends into your image. If it’s just in the corners, drag the slider way over to the right. If it’s a bit farther out, drag it to the left (basically, drag the Midpoint slider back and forth a few times and you’ll see what I mean). TIP: SELECT YOUR LENS IF CAMERA RAW DOESN’T DO IT AUTOMATICALLY: If you turn on the Enable Lens Proﬁle Corrections checkbox and nothing happens, it just means, for whatever reason, Camera Raw couldn’t ﬁnd the built-in lens proﬁle to ﬁx your lens problem automatically. All you have to do is go to the Lens Proﬁle section and choose your brand (Canon, Nikon, Sony, Fuji, etc. ), and it’ll almost always ﬁnd the proﬁle for you (well, as long as it actually exists in Camera Raw’s database). If it doesn’t, then you’ll have to choose your lens yourself from the Model pop-up menu. Click on the Detail icon (it’s the third one from the left) beneath the histogram and, at the top of the panel, you’ll ﬁnd the Sharpening controls.The Amount slider controls the amount of sharpening (please forgive me for explaining what this slider does).The Radius slider determines how many pixels out from an edge the sharpening will affect, and I usually leave this set at 1.0. If I run into an image that needs to be super-sharp, I’ll occasionally move it up to 1.2, or even as high as 1.3, but that’s about as high I’ll go.The next slider down is Detail. I recommend leaving this set as-is (I’m not usually a fan of default settings, but this one is actually good).This slider, set where it is, allows you to apply a higher amount of sharpening without seeing a halo around the edges of objects in your image (a typical side effect of too much sharpening), so it’s an improvement over Photoshop’s Unsharp Mask filter. If you want sharpening that looks more like the Unsharp Mask, then raise this slider to 100 and it’s pretty much the same (you can expect to see halos fast if you set the Amount slider too high). Last is the Masking slider. I only use this when sharpening objects where I don’t want the entire image sharpened equally—I just want the edges sharpened. For example, if I’m sharpening a portrait of a woman, I want to sharpen her eyes, eyebrows, teeth, lips, etc., but avoid sharpening her skin because it brings out texture we don’t want to enhance (we want to keep it smooth). 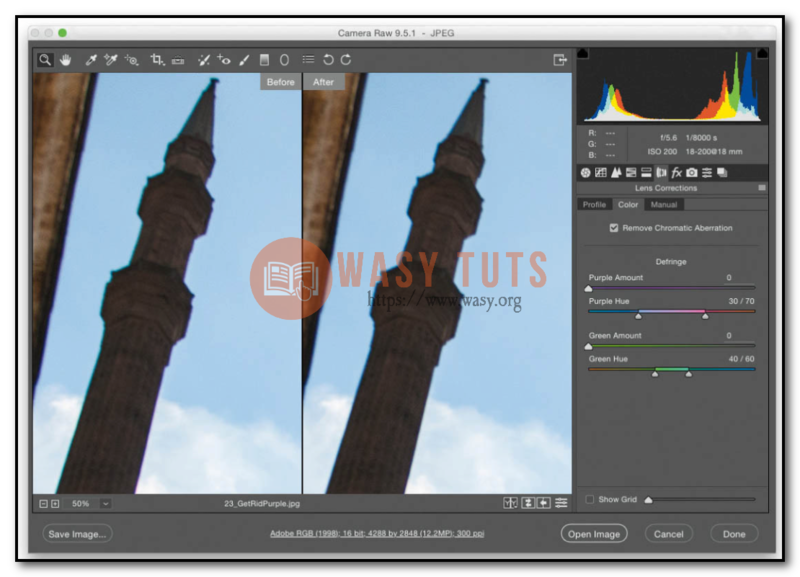 By raising the Masking amount, it narrows the sharpening to just the edges. Press-and-hold the Option (PC: Alt) key as you drag the slider to see what it’s affecting. Areas that turn black (as seen in the inset above) are not being sharpened—only the white areas get sharpened. 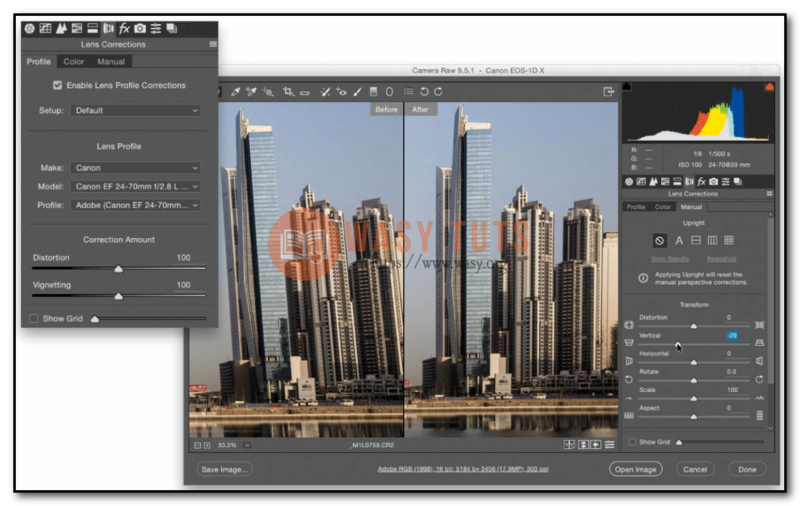 First, select a bunch of images you want to edit in Adobe Bridge, then press Command-R [PC: Ctrl-R]) to open them all in Camera Raw, and the images will appear in a ﬁlmstrip (along the left side of the Camera Raw window. By default, you’ll only be editing which- ever of those images in the ﬁlmstrip is currently selected, so if you want to edit them all, click on the icon to the right of the word Filmstrip at the top left, and choose Select All from the pop-up menu that appears (or just press Command-A [PC: Ctrl-A]). Now, click on the image in the ﬁlmstrip you want to work on, and any changes you make to this image (which Adobe calls “the most-selected image”) will be immediately applied to all your other selected images at the same time. It’s pretty much a “change one, it changes them all” type of edit, but it’s one of those things that can save loads of time, especially when changing things like exposure or white balance across a lot of images all at once. When you’re done, either click the Open Images button to open all the selected images in the ﬁlmstrip in Photoshop, or click the Done button to apply those changes without actually opening any of the images. You can use the regular Undo keyboard shortcut of Command-Z (PC: Ctrl-Z) to undo just your last change, but Camera Raw lets you undo any change you’ve made because it keeps track of all the changes you’ve made to your image in the background. To undo each step, one at a time, just press Command-Option-Z (PC: Ctrl-Alt-Z), and it undoes your last step. Press it again, and it undoes the previous step to that, and so on. To create a preset, click on the Presets icon (it’s the second one from the right) beneath the histogram, and then, at the bottom right of the panel, click on the Create New Preset icon (it looks like a little page with the bottom-left corner turned up).This brings up the New Preset dialog where you choose which things you’ve done to the image you want it to save to your preset (this is ideal if you’ve tweaked your image, and you want to get this same look again, without having to remember all the settings.You’ll now be able to get that look with one click). By default, it has every single checkbox turned on (just to be safe, it remembers everything, even if you didn’t touch a particular slider).You can leave it like that, and it’ll remember what you applied, or if you want a more efﬁcient preset (one that only includes the things you actually did to this image), you can choose one of the presets from the Subset pop-up menu at the top of the dialog. For example, choose Basic, and it just leaves the check boxes turned on for things you might have done in the Basic panel (like Exposure, White Balance, Highlights, etc. ).These are just shortcuts to save you time—you can uncheck/recheck any setting you like. When you’re done, give your preset a descriptive name (like Cool Blue Look, or High-Contrast Effect, etc. ), click OK, and now that preset will appear in the list in the Presets panel.To apply that preset to a different image, open the image in Camera Raw, click on the Presets icon, then click on that preset and it applies that exact same look to the image. Click on the Detail icon (it’s the third one from the left) beneath the histogram, and you’ll see the Noise Reduction section right below Sharpening.There are two parts to this section: The Luminance slider reduces the noise specks you see in the image by slightly blurring the image (that’s pretty much what noise reduction does—it hides the noise behind a blur). If you drag the Luminance slider to the right, and you start to see that you’re losing either detail or contrast in the image, you can use the two sliders right below to add them back.You’d use the Color slider if you saw red, green, and blue specks in your image—this does a good job of desaturating them, so you don’t see them. Dragging this slider too far to the right can, once again, cause a loss of detail, so you can bring back some of that detail using the Color Detail slider below. The Color Smoothness slider is different—it doesn’t bring back stuff.You’d use this to smooth out larger patches of color noise—just drag it to the right to help smooth those patchy areas out (you probably won’t see these larger patches unless you’re brightening up a really dark area in your image). Keep this one thing in mind when you’re reducing noise: using this feature blurs your image, from a little to a lot, depending on how far you drag the sliders. So, think of this as a balancing act—your job is to ﬁnd that amount at which the noise is reduced without the image getting too soft. Click on the Camera Calibration icon (it’s the third one from the right) beneath the histogram, and go through the different proﬁles in the Camera Proﬁle pop-up menu to ﬁnd the one that looks the most like your JPEG ﬁle. Why would you want your RAW image to look like a JPEG image? It’s because JPEG images, in the camera, are sharpened, and more contrasty, and more colorful, and they all have this stuff added in-camera to make them look great.When you switch your camera to shoot in RAW mode, you’re telling it to turn all that sharpening, and contrast, and stuff off, and just give you the RAW photo (so you can add your own amount of sharpening, etc., using Lightroom or Photoshop, or whatever). So, your images look ﬂatter when you shoot in RAW.What’s worse is, even though you’re shooting in RAW, your camera still shows you the nice, colorful, sharp JPEG preview on the back LCD, so you only see the ﬂat version once you’re in Camera Raw. By the way, the way I ﬁnd a proﬁle that most looks like the JPEG preview is to take a few shots in RAW + JPEG mode (so your camera creates both a fully processed JPEG photo and the more ﬂat-looking RAW image at the same time). Open both of those images in Camera Raw, then click on the RAW image in the ﬁlmstrip and try out the different proﬁles, and then compare it to the JPEG until you ﬁnd the one proﬁle that looks the most like the JPEG.You can then save that as a preset and apply that look to your RAW images with just one click. To ﬁx that lens distortion that causes things like doorways and buildings to look like they’re bulging outward toward the viewer, click on the Len Corrections icon (it’s the sixth one from the left) beneath the histogram, then click on the Proﬁle tab, and ﬁrst try turning on the Enable Lens Proﬁle Corrections checkbox (as seen in the inset). That alone will sometimes ﬁx the problem (make sure you see your lens make and model in the pop-up menus below the checkbox. If you don’t, choose it from those menus—usually just choosing the brand will be enough for it to ﬁnd the exact lens you used from its internal database). If the proﬁle correction helped, but not quite as much as you’d like, in the Correction Amount section is a Distortion slider that lets you ﬁne-tune the amount— just drag it to the right. If that still isn’t enough of a ﬁx, click on the Manual tab, and then drag the Distortion slider at the top to the right until the bulging ﬂattens out (yes, you’ll have to crop the edges away when you’re done). 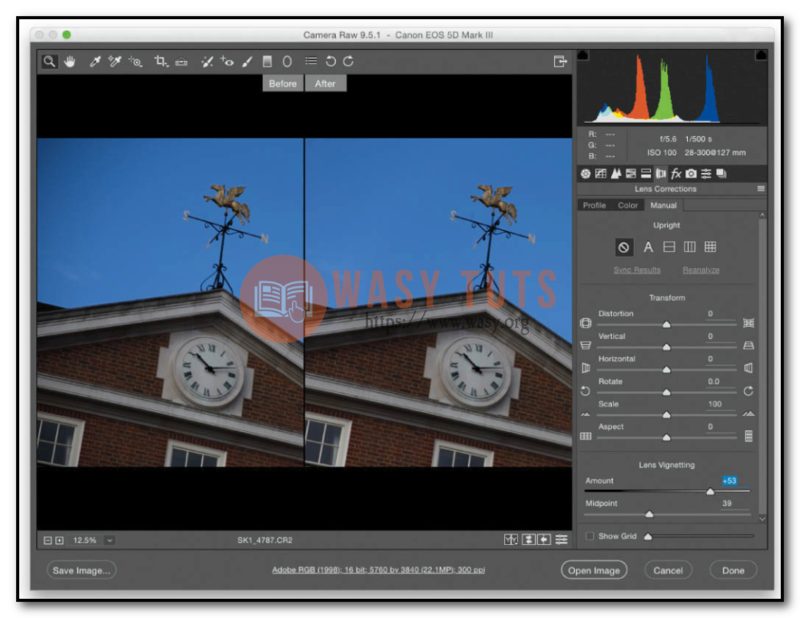 To get rid of this keystoning effect, click on the Lens Corrections icon (it’s the sixth one from the left) under the histogram, click on the Manual tab, and then click-and-drag the Vertical slider to the left until the building looks straight (it stops looking like it’s leaning). There’s an automated method, too: click on the Proﬁle tab, and turn on the Enable Lens Proﬁle Corrections checkbox (as seen in the inset.Your lens make and model should appear in the pop-up menus below. If it doesn’t, just choose it yourself). Next, click on the Manual tab, and in the Upright section, ﬁrst click on the Auto (A) icon and see how that looks. Chances are it ﬁxed the leaning back problem. If it didn’t, then click on the Vertical icon (the second one from the right). If neither of these did the trick, click on the Off icon, then use the Vertical slider below to do it manually, like I mentioned at the beginning of this tip. 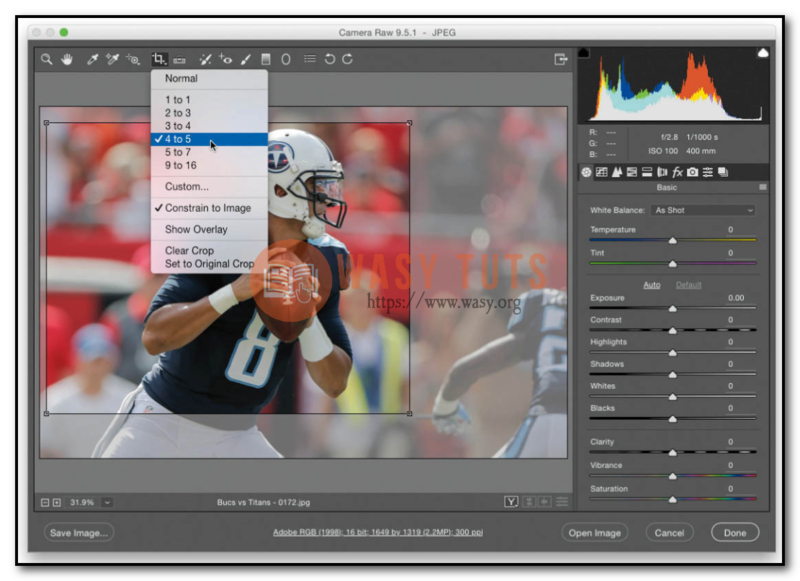 In the Basic panel, click on the little triangle in the top-right corner of the histogram to see areas that are clipping the highlights, or the little triangle in the top-left corner for shadow areas that have turned solid black. Now, any areas that are clipping in the highlights will appear in red (as seen above), and you can drag the Highlights slider to the left to reduce, or hopefully remove, that clipping. If you turned on the shadows clipping warning, those areas will appear in blue, and you can ﬁx them by dragging the Shadows slider to the right. Click on the Lens Corrections icon (it’s the sixth one from the left) beneath the histogram, click on the Color tab, and then turn on the Remove Chromatic Abberation checkbox. That alone might do the trick, but usually you’ll have to go to the Defringe section below and drag the Purple or Green Amount sliders to the right until you see the fringe dis- appear (well, the edges turn gray instead of purple or green, so it just blends right in). While I normally don’t have to do this next step, you’ll want to know it, just in case: if you move a slider (the purple or green) and it doesn’t affect the purple or green fringe, you can move the Purple or Green Hue sliders to ﬁnd the exact shade of the fringe color. Again, I hardly ever have to move the Hue sliders, but it’s nice to know they’re there in case you do. If you want to see what your image looked liked before you made edits in the current panel (for example, if you applied some sharpening in the Detail panel, and you want- ed to see a before/after of just the sharpening—not all the changes you made since you ﬁrst opened the image in Camera Raw), then click on the fourth icon from the left beneath the bottom right of the preview window (shown circled above) or just press Command-Option-P (Ctrl-Alt-P). That will toggle on/off a before/after view of just the edits you made in that one panel. Of course, if you want to see a true before/after of all your changes (no matter where you made them), press the letter P on your keyboard. To see a side-by-side before/after, press the letter Q to toggle through the different before/after layouts (side by side, top and bottom, or split screen).